I don't even know where to start. I guess I'll just write it all in chronological order from when I heard other people's stories and then experienced whatever it was for myself. To preface this, I should mention that all of this took place back home on my reservation (I'm Algonquin First Nation from Canada). Another thing I should mention is that, on the Rez, traditional beliefs and legends of the paranormal are still big part of our community. The attitude of most people towards the paranormal is one of assurance. To us, the paranormal is a regular part of life, we believe in a spirit world, and we believe that sometimes these "beings" can cross over into our world and maybe even live among us. When I tell paranormal stories to my non-native friends, they're always in such disbelief that things like this have actually happened and how casually I talk about it, but it's only because it's been so normalized for me. Where they have absolutely no paranormal experiences, I have a bunch and most everyone I know on the Rez has even more than I do. I don't really care to explain it, maybe we're all crazy from drinking our toxic tap water lol (@JustinTrudeau). I don't know. This all happened in the Fall of 2011 when I was 16 years old. I was living in a nearby city with my mom so that I could get a better education than the one I could get back home, but we'd go back every single weekend to see my dad and little brother. One Friday, during the drive back home, I got a text from a friend of mine. She told me about a party that was happening that night and asked me when I'd be home so they could come pick me up. I gave her a time and that was that. We get home and as soon as we stepped inside the house, we see my dad and my cousin sitting at the kitchen table drinking some beers. They're both cops on the Rez, so usually, beers with his partner on a Friday evening, means that they had a particularly tough week at work. Typically, the toughest cases to deal with are child abuse and molestation, so a part of me felt sad immediately that something that bad had happened. They both look tired and drained, but they're happy to see us. We say our greetings, catch up a little, and my dad asks me if I have any plans. I tell him about the party and where it'll be, and he and our cousin share a weird look. "Why are you guys making that face? Did something happen?" I asked. "I don't know, should we tell her?" My cousin said, looking at my dad. He laughed, and they decided that I should probably know what's been going on since I'd be going to a cottage pretty deep in the woods later that evening. They start with the first strange call they got on Monday night. An older woman called saying that people were outside of her house knocking on all of her windows. She said she couldn't see anybody, but there must have been at least three people judging by all the different locations of the knocking. They arrive at the woman's home, inspected all around the house, even checked the woods, but nothing came up. They tell her that it's probably just some teenagers playing tricks on her and that there isn't much else they can do, besides patrol around the area in case they come back. On Wednesday night, the same woman called again with the same problem. It had rained that day and there was mud all around this woman's home, so they figure that at the very least, they'd find footprints, but they couldn't find a thing. This is when they started feeling like something was off, because one of the windows where the woman was adamant about there being knocking was completely impossible to get to without stepping through this huge mud puddle. This is when they started to think that the woman was lying, but they just told her the same thing they told her a few nights prior. By Thursday night, everyone on the Rez had been talking about these strange experiences. It turns out, this woman wasn't the only one experiencing the knocking, she was just the only one to call the police. I mean, all of this was taking place on a Rez, so it wasn't long before people were linking it to supernatural causes. My dad was still sure it was just a group of teens pranking people, but then they got another call from the same woman for the same reason. They rushed over and were met with the same situation, except this time, the neighbour walked over looking pale as a ghost. He says, "Is this about the knocking?" They notice he's a little shaky. "You guys are gonna think I'm crazy, but yeah," and he goes on to explain what he saw. He said that he'd stepped outside for a cigarette on his front porch when he heard knocking. He looked around to see where it was coming from and when he looked to his neighbour's house, he saw it. There was a black figure standing outside the woman's window (the same one with the mud puddle I mentioned) looking into her home. He said it looked humanoid in stature, but completely made out of shadow. You could tell it was something solid-ish, but you couldn't make out any features on it. He stared at it, completely in shock, and watched the thing as it knocked a couple of times and then darted around the house knocking on every single window. He said it moved too fast to be human, it was practically a blur. It went around the house a few times, then ran across the road into the treeline, behind one tree in particular. The man was frozen, but he couldn't look away. It then leaned out from behind the tree, staring directly at him with yellow eyes that reflected the light similarly to a cat's, and then it smiled, showing its small, but numerous pointed and sharp teeth. "I almost sh*t my pants," he had attempted to joke, but his voice was still shaking. Fast-forward to Friday, stories are being exchanged all over the Rez about other sightings and experiences people were having. On top of multiple people experiencing the knocking, there were also quite a few sightings with everyone describing the creature in the same way. One woman was bringing her trash bin to the road, when she thought she saw someone in her peripheral vision standing near the trees. She walked back up the driveway and into her home, feeling like she was being watched. Right before she was about to open her door to go back inside her home, she looked back and saw two reflective yellow eyes watching her from the trees. She said it was about 5 feet above the ground. Another couple was driving at night and they saw a humanoid figure standing in the middle of the road. As they got closer, they slowed down, and it turned around to face them. That's when they saw the reflective yellow eyes and the sharp, pointed teeth as it smiled at them. They stopped the car, too afraid to go closer to it, until they decided to just drive past it. Being on a narrow road, they drove past it with the figure being only a few feet from the window, staring at them the whole time. "You sure you still want to go to that party?" My dad asks, but my friends were already pulling into the driveway. I gave my family hugs and kisses goodbye, and they told me to be careful, but I felt fine. A common belief among Native people is that negative energy attracts negative energy, therefore an evil spirit will be drawn to people with unresolved issues, traumas, and "sinners" I suppose. If you're someone who is spiritual, self-aware, and basically a good person, that, in and of itself, will be protective. I get to the party and within 20 minutes, the conversation shifts towards all the paranormal experiences people have been having. I'm really curious about what everyone has to say, because they have stories that I hadn't heard yet, but my friend (us being 16 and all) couldn't hold her alcohol very well and was crying about how she wishes she was closer with her brother. I was trying to make her feel better while listening to everyone's stories. One of the people at the party, was related to the neighbour of the woman who was calling the police. The experience really shook him up and my friend was just explaining everything that he was doing later on. For one, he smudged his entire home, which is something our people do when we're looking for extra protection against paranormal entities. He also went to visit multiple elders around the community asking for advice and any information they had on similar "happenings". What we do know about paranormal experiences on the Rez, is that they don't happen as often as they used to. If you talk to one of our elders, they have endless stories and even more advice to give about how to protect yourself compared to now. One of the explanations that was given to this guy about the "shadow thing" was that it was evidence that someone was doing an unauthorized 'shaking tent' ceremony. If you don't know what that is, you can look it up, but it's basically (and I'm generalizing) like a Ouija board session that takes place inside a tent of some sort. People stand around the tent, while the shaman-type dude goes inside and asks questions. The tent begins to shake and you can hear the voices of spirits coming through. I've never personally been to one, because we haven't had a good enough reason to make one, but typically our ancestors used shaking tent ceremonies when they were starving in the dead of winter and needed some direction on where the nearest food source was. My mom's been to one, and her story is absolutely crazy. She described multiple voices of men and women, only speaking the native tongue, and they were upset that the people were doing a shaking tent ceremony when they weren't on the verge of death. The people there had to explain that were only doing the ceremony to prove that it was real as we had been losing our culture as a result of residential schools, but the spirits were angry about this, saying that the bridge between the two worlds should never be opened unless absolutely necessary, because you don't know who you're communicating with. It could be evil spirits and it could be good ones, it could be ancestors, but you never know. Anyways, the elders told him that this spirit crossed over into our world because of a shaking tent ceremony. Someone on the reserve has been doing them without consultation of the elders. So, we started thinking about who would do that, without proper guidance and without good enough reason to do so. Then two of the drunkest dudes at this point start saying sh*t like "Ah, I'm not scared, that thing could show up now and it couldn't do sh*t" basically egging it on. All of us were looking at each other like, why the f*ck would you disrespect an evil spirit? That's exactly how you attract it to you, and that's when I decided to leave the sunroom where everyone was hanging out. I went to the living room to console my drunk, crying friend, when I noticed that the rocking chair outside on the porch was going back and forth. I looked away immediately, refusing to make direct eye contact, but I did look at it from my peripheral vision. Anyways, I'm inside the cottage and I keep seeing this rocking chair going back and forth and back and forth, but another thing we're raised to do in our culture, is to ignore paranormal experiences. Spirits feed on the energy that people put towards them, so if you freak out, if you get angry, if you yell at it, or start crying, that's exactly what it wants and it will stick around once it gets a reaction. It thrives on energy of any kind, so while I knew something fucked up was happening on the rocking chair, I wasn't about to pay it any attention. 5 minutes or so goes by and I'm still seeing it move in the corner of my eye. That's when my friend screams and she runs to the other side of the sunroom. My other friend sprints to where girl was sitting and busts through the French doors onto the balcony. All of this happens in a split second, but I immediately go to the patio and ask what's going on. 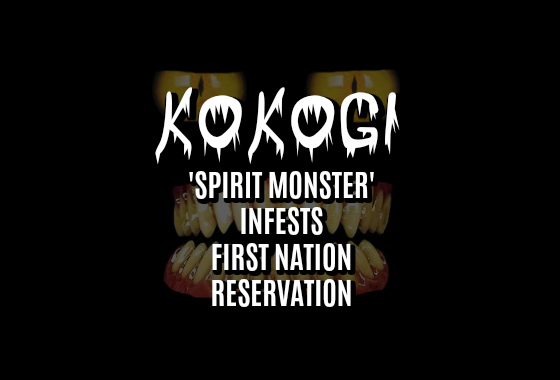 The girl is crying on the couch with friends all around her, she claims to have seen the spirit (which we later nickname Kokogi, Algonquin word for 'monster'). She said she was listening to the boys talk about the spirit, when she saw boy's face as he was looking out onto the balcony behind her. She turned around to see was he was looking at, and directly on the other side of the window, was the shadow spirit sitting on the rocking chair, smiling at her, literally three feet from her. That's when the boy sprints towards it and busts through the French doors. I walk outside to find the boy and he's on the lawn, staring into the woods. I call his name and he looks up at me. All he says is "get everyone inside" and the tone of his voice just makes me automatically obey. I get all the drunk teenagers inside the cottage. This is when the phrase "come at me, bro" was just gaining popularity, so you could imagine the drunk kids yelling that into the woods, it was terrible. I eventually get everyone inside and girl is now in a trance, freaking everyone out. She doesn't speak to anyone, she doesn't say anything but "I want to go home." The boy comes back inside and tells everyone to clean up, and that we should leave as soon as possible. Everyone has trash bags and are cleaning away all the beer bottles and cans away. Everyone goes into the cottage and it's only me and the other boy in the sunroom now. I look to him for answers and all he says is, "it's outside." I nod and start cleaning faster. The sooner we're out of here, the sooner we're away from that thing. As we're cleaning in the sunroom, we hear knocking on the windows in multiple places. The entire sunroom is made of glass, but its dark out, so you can't even see outside. I immediately look to the boy and he just says "ignore it." Within two seconds, someone comes running out the bathroom and says "I'll f*cking kill whoever's outside knocking on the bathroom window" but everyone's inside and accounted for. Someone else comes running out of the bedroom saying that there was knocking on the window in there as well. Now, everyone's freaking out, and me and the boy, and our one other friend are the only sober ones to calm everyone down. We get the place clean and get outside to the cars immediately. Everyone's getting into the trucks and I'm standing with the boy, he's relaxed, but then all of a sudden looks behind me and shoves me inside his truck. We peel out of the driveway and drop everyone off. A few days later, I end up hanging out with the same boy and he tells me the story from his perspective. He said, that when the boys started talking sh*t about the spirit, it appeared on the rocking chair behind girl. He said he made eye contact with it, and couldn't look away. They were staring each other down, and that's when the girl saw his expression. He said it was instinct to defend the people he was with, and ran towards it. He said that the feeling he was getting from the Kokogi was almost like he was daring him to do something. He said the second he got up, the Kokogi stood and ran into the woods, disappearing from the patio in a blur. He ran off the porch, and was looking around the lawn, when he saw it standing at the tree line, looking right at him with a smile on its face. He said the whole time it felt like it was mocking him. I called the boy's name and it disappeared. He didn't see it again until everyone was getting into the trucks, which explains why he suddenly pushed me inside. He said that it was standing on the far end of the truck, super close to us. Later than night, when he'd dropped everyone off, they realized that they never locked the door, so he went back to the cottage, but his friend (whose cottage it was) was too scared to go in. He goes in by himself, but the second he opens the door, he sees the thing standing inside the living room. He locks the door as quick as he can, and they peel out of the driveway. So yeah, sightings continued for a few days after that. We definitely weren't the only people on the Rez to have experiences like this, and then it stopped all of a sudden. It was the talk of the Rez, everyone was curious about what happened to it. Would it come back? What was it? Etc. But word ended up getting around that there were sightings north of our community. White people in the town just north of us were having sightings, then other reservations were having sightings as well. It was like it was traveling north, the way the stories were going. Anyways, it's 2018 now and no one else on my Rez has had any sighting of this particular thing.